I have gotten a huge response from my post on sock bun curls! It is an easy and beautiful way to style your long hair, especially for busy moms- on the go. I had numerous questions and wanted to give you lady’s a video example of sock bun curls. I am so excited to hear that so many of you are trying the sock bun curls. If you have not read my first post on this easy style, please do. It gives a photo and picture tutorial on how to get beautiful curls in your sleep using a sock. I am also glad to know that I am not the only mother that has run out the door a complete mess on many occasions! I have used this technique on my own hair many times and get great results. I have gotten a lot of comments from people saying that it looked great, some saying that it did not work on their hair, and some wanting to know more and see a video. I hope that I did not give anyone false hope in my previous post by saying anyone can do this. When I said that, I meant that everyone has a sock on hand, and everyone can roll it in their long hair. However, this technique will not work on every single type of hair. The results in my picture will not be the same on every hair type. I think the best way to look at the sock bun curls is with an open mind and willingness to try something new and experiment with your own hair. For me, it is a fun and easy alternative to curling my entire head of hair with a curling iron. If you are going to give the sock bun curls a try – do it at a time that gives you the option to try again in case it does not work for your hair type. Since every type of hair reacts differently to styling methods, I cannot give you all the answers, but I hope that you will experiment on your own so that you can make this work for you. The time and effort that you will save in the long run is well worth the effort. I have created a video for you all so that you can see exactly how I roll a sock and put it into my own hair to create curls. The first video will show you how to roll your sock (with the toe cut off) into a ring. It also demonstrates how I put my hair into a ponytail and spritz it with water. Basically, video number one is how to prepare your sock and hair for putting in a sock bun. Video number two will show you how I actually wrap my hair onto the sock ring to create the sock bun. This process is pretty simple once you get it started, especially if you do not have layers in your hair. If you do have layers, like I do, this process is doable if you are patient and take your time. I do my best to neatly tuck and smooth all of the layers under the sock then do one roll of the sock and repeat. Tuck and smooth, roll, and repeat. Practice makes perfect here! Don’t be afraid to take it out and start again if it doesn’t feel smooth. Your curls will not be smooth if they are not rolled neatly onto the sock. Here are three pictures of my own hair using the sock bun to create curls. Picture number one is a sock bun applied to just showered and air dried hair. These are the exact curls that I got from the sock bun that I applied in the video. You can see the before of my hair in video number one. Picture number two is day two of sock bun curls (from the above picture) put half up. Picture three is a sock bun applied to day old hair. 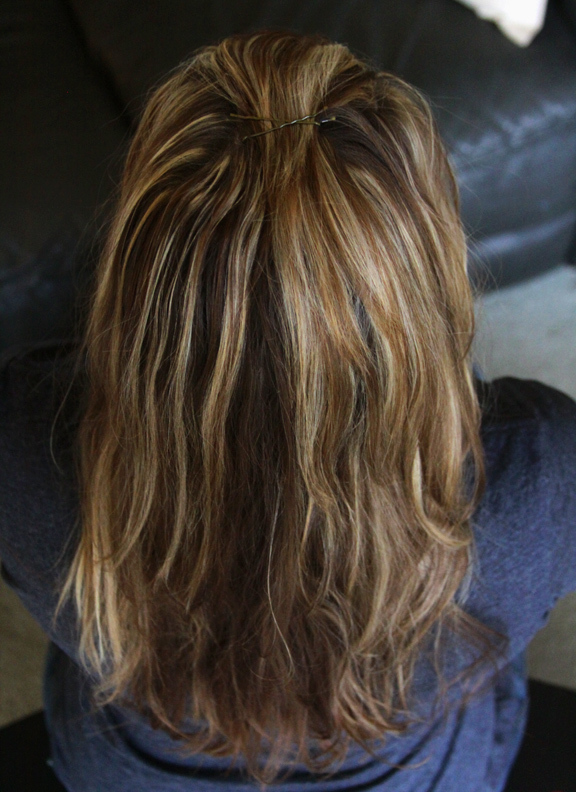 To get rid of the “kink” from the hair band try wrapping a small section of your hair around the ponytail and securing with a bobby pin (instead of using a hair tie). I would also suggest trying a “scrunchie” type hair tie or a doubled up knit headband (as I did in video number 1) in place of an elastic hair tie. A reader suggested that you use the tip of the sock that you cut off, and another cuts the hair tie out after the bun is in place. If you get “frizzy curls” I suggest adding some hair product (anti frizz serum or something along those lines) before your hair drys. If your hair is frizzy to begin with you might need to blow dry it smooth before you try the sock bun (I realize that requires heat) but you still are not putting a hot iron in your hair and the result will be much different for you. Make sure that your hair is completely dry before you remove your sock bun in the morning. You may have to experiment with the level of dampness that you begin with in your hair. It is a crucial part of making nice curls using a sock bun. I have also heard others suggest using more than one sock for ladies with a ton of hair, or a small child sized sock for tighter curls on hard to curl hair. I have not tried either on my own hair – but think that both techniques would work to achieve a different effect on other types of hair. Have fun and experiment! I have found that it works best for me on day old hair (after it has smoothed out a bit from air drying). Happy curling – I hope that my video gives you a good visual of how to roll a sock bun to get curls. I truly hope that this helps moms- or busy woman like me who put them selves last but would like to look fancy now and again! thanks for the video!! excited to try it! You ROCK! Thanks, I can’t wait to try it with my hard to curl hair. Will let you know how it works out. So thankful you shared your wisdom (and time, talent, etc) to help us mamas in need! 🙂 Great visual tutorial. I’m trying it tonight! thanks for this great idea! Im a stay-at-home mom with 3 kids and NO time for beautification anymore! this is the longest my hair has ever been and I am so thankful for a new technique to try! Just got my bun up, can’t wait to see results in the morning. 🙂 Thanks again, Liz. My Mother use to curl our hair years ago with strips of cloth instead of socks. You just cut strips of cloth and roll your damp hair around them and tie a knot just like with the socks. Gets the same results. But I do like the sock bun ideal. So Curious- many said they were going to try this. Did you try it and how did it tuen out? idk how to do this! its so hard and i have short side bangs and its very hard ;( my bun is very messey and keeps falling out any advice? I have the same problem I put my messy bun up high and used a hair clip to clip the bun to my head in front so it won’t hurt to lay on it. Also used a little mist of hairspray to keep a light hold. I tried it last night and it worked like a charm. I have pretty long hair and layers, but you just kind of have to go for it. The video is really really helpful. I touched up a couple curls in the morning but it cut my styling time to practically nothing. It’s practically a miracle. Makes mornings so much less daunting. Many Thanks Desiree!! I hope your readers enjoy it! Wow this really works, I love it. I have hard to curl hair and hate sleeping in foam rollers, the sock didn’t bother me at all. Thank you for sharing a great idea. This worked great for me too. However,I cant seem to get my thin hair tight enough. But the curls come out great and so easy to sleep in. That’s funny, I can’t seem to get my thick hair tight enough! My bun is huge! YAY!! Now I may have a chance at actually looking put together when I leave the house! The pony tail I’ve been rocking since my newest addition came along is getting seriously old. How on earth do you do this with layered hair? 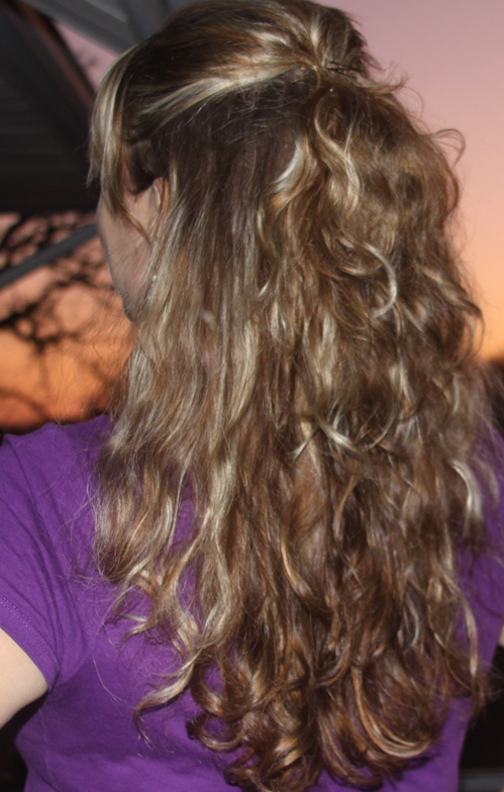 I have thick hair to the middle of my back with layers coming to my shoulders. I can’t even get the sock rolled once over without all of my layers falling out. Then I can’t hold the sock up withone hand AND pull my layers up with the other AND roll at the sme time. The more I roll, the more hair falls out of it. I’ve tried a thick sock, a thin sock, product, no product, everything! I bet if you have heavy, slippery hair this is quite difficult. I haven’t tries this, but what if you cut another sock and didn’t roll it into a ring. Instead, put your ponytail in it (so it spans the length of your hair. Maybe that will keep the layers in place and then you can roll another sock (ring) over it???? Just a thought. Maybe even a piece of cut pantyhose or tights?? Worth a shot, right? I have a ton of layers in my hair and I also had problems with my layers staying in the bun. I leave the sock unrolled and that way it covers all of my hair and then rolled it down into a bun, it worked out better for me! Good Luck! what if you flipped over and let gravity keep your hair in the same direction? I would try 2 sock buns, one for the longer hair and another for your layers. I love your tutorial! I have a post about my results waiting to be published on my blog, I hope it’s ok if I linked back to your wonderful videos! I am actually typing this post with a sock bun in my hair! Thanks so much for the video. I have seen this pinned before and wanted to try it but I couldn’t figure out how to start it. You explained and showed it perfectly! I can’t wait to try it. Thank you so much – glad you found it easy to follow! Looking forward to trying this! I have curly/frizzy hair and am ready to try something besides a ponytail! Hi! funny thing I have naturally curly hair but I like a more controlled curl and “stumbled upon” this site :-)I think this idea is AMAZING!!!!! VERY SMART!! ENVIRONMENT SAFE! HAIR STRENGTH SAFE! TIME SAFE!! EVERYTHING ABOUT IT IS JUST AWESOME!!! 2 THUMBS UP! 5 STARS FOR SURE! 🙂 THANKS FOR SHARING! Couldn’t you just roll your hair around a scrunchie like you used to tie your hair up in the first video instead of cutting up a sock? It is worth a shot! I would worry that there might not be enough fabric on it to have a solid structure to roll the hair onto. The rolled up sock is far firmer and thicker than the scrunchie but if you had shorter hair – I bet it would give a tighter curl. this is the coolest idea. i just have one question: will it work for shoulder length hair??? I have done this on my mother in laws hair that is layered and shoulder length. I use a child sized sock and then cut a little extra piece off of the sock and put it around the finished bun to hold down the little ends that don’t quite tuck in. 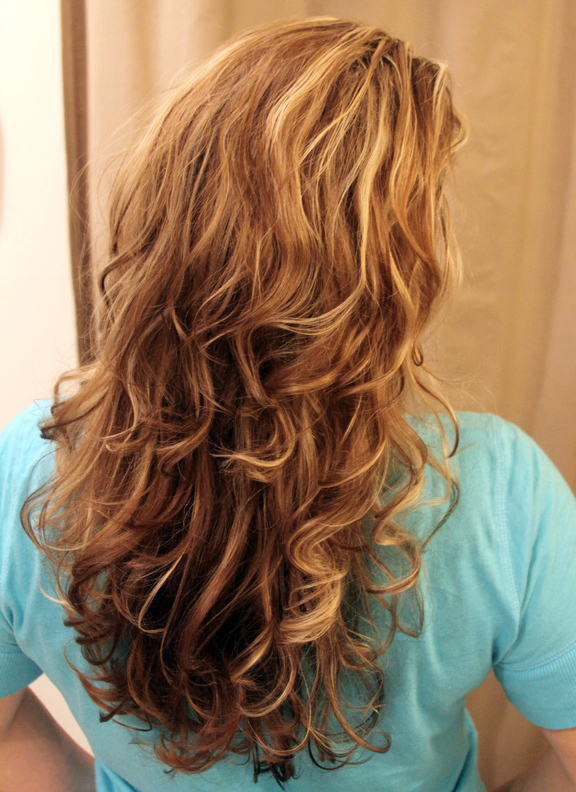 The curls don’t look exactly like in my photo – but they look great on her hair. I am not a mom but I’m definetely gonna try this! Ooooh! Very excited to try this! Maybe I’m a bit slow, but how do you get the bun out the next morning?! Just unroll?? Absolutely – just unroll the bun from the base of your ponytail to the ends (opposite of how you rolled it on)! Good luck! I tried this two nights ago on the night it had been washed, and it came out okay looking in the morning. The biggest tip I would have, is to make sure when you are tucking the ends in, don’t have them going in at awkward angles or crinkled because they will come out that way! I tried it again last night on unwashed hair, and it came out looking lovely today! Hi, I’m trying it tonight! When u rolled it on unwashed hair did you put product in to get it a little wet or did you spray it a little? I have layers and i think i might have rolled it a little awkward??? Maybe I should redo it and take a little bit more time? thanks! I tried it yesterday and it turned out wonderful, for like one hour… Any tips for keeping this look longer? I put some hairspray in it to hold this look but it just won’t work? Furthermore, i read your previous post and it mentioned pintrest. I looked into it and was wondering whether you could send me an invite if that is not too much too ask. I would try some mouse or gel in your wet hair (I use a combination of both when I use product) and then letting it air dry. Then try the sock bum and see if it holds any better! Good luck! As far as Pinterest goes I highly recommend it. I love it to keep track inspiring things that I find online. Just sign yourself up on their page and they will invite you via-email! Hopefully I will see you pinning soon! Is there a kink from the pony tail when you take it out? 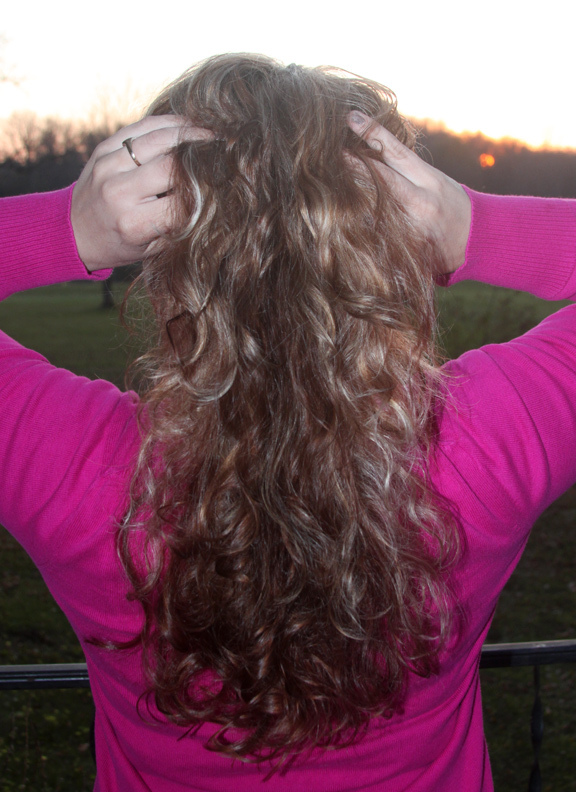 I do notice a small kink sometimes, but for me it generally blends in with the curls, and is hardly noticeable. The best technique I have found is to cut an extra piece of the sock toe and use that as a ponytail holder. That’s what I used and it works perfectly. Seriously, this technique is a lifesaver. I am an actor and often have to do my hair for auditions before I go to work in the morning. This whole sock bun phenomenon means I don’t have to get up super early and wrestle my long hair with the curling iron for curls that don’t even last all day. I undo the sock bun, pin the top back, and I’m out the door. THANK YOU. So glad to hear that the sock bun has saved you time and effort in your days! It really is a great trick! Thanks so much for stopping by and commenting! When was the last time that you had your hair trimmed? The ends of our hair take a lot of damage and they may be split and this could keep your ends from styling at all. Just a tip. Hope you find a way for it to work. I am gonna be trying it for work. I might try it a day in advance so I don’t look crazy for work in case it doesn’t work.